OK, so I've left it a little late this week to join in with Lou's foraging challenge for her Nature in the Home series. To be honest I was lacking inspiration but then my heart skipped a beat when I saw Karen's Kerria japonica and I knew instantly that I could find some spring treasures in my Mum's garden. 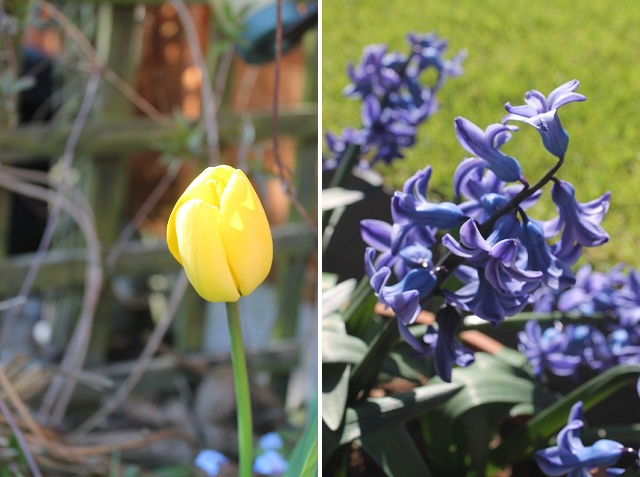 Nothing gives me more pleasure than an hour or so of chat and coffee at my parent's home and on such a scintillating spring day I couldn't resist dropping by to catch up, bask in their conservatory and potter around their lovely established garden. I found Kerria japonica and so much more and my Mum wouldn't let me leave empty-handed. 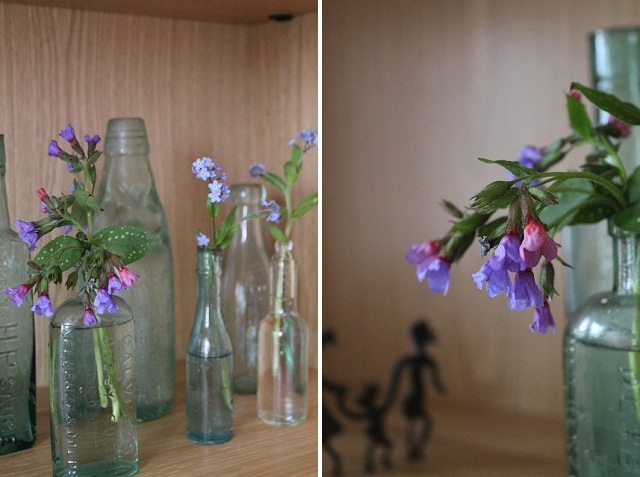 Plenty of spring pretties for my vintage bottles and my new garden. I just love the pastel shades of Forget-me-knots and Pulmonaria. See little green shed for more spring booty. Love the Pulmonaria with its shades f blue and purple. There is always something in the garden. Beautiful little flowers! I love them. Great nature around ( and in) your home! I love the way you have utilized the bottles to show off the spring flowers. Lifts the spirits doesn't it? Love your photos with the bottles! Great to see so much blooming. Lovely flowers. We have a little jug full of forget me nots too! I love the look of all those fresh petite flowers in little glass jars. Forget-me-nots are one of my favorites.